Papercrafts by Patti: Oranges to Say "Thank You"
Oranges to Say "Thank You"
Here is the card I promised from yesterday. I CASEd this from Sandi MacIver. This oranges pattern from the same Whole Lot of Lovely Designer Series Paper once again is the focal point of a lovely card and lets you make many cards like this one! Sandi ingeniously added a sentiment on vellum so you can still see every inch of the orange print. The print is cut 3" wide by 3-3/4" long by 3" wide. The piece of Tranquil Tide card stock underneath the print is 4-1/4" long and 2-1/2" wide. The vellum strip with the white heat-embossed sentiment (from Rose Wonder stamp set) is 5" long by 3/4" wide. It is anchored by using two glue dots on the under side and two Gold Faceted Gems on top to conceal my glue dots. Thank you for looking today! Please leave me a comment so I know you were here! 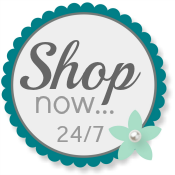 Use my Online Store when you are ready to order your Stampin' Up! supplies. Lovely card. I want to try the sentiment on vellum!